There's a tendency to think of the birchbark canoe as dominating New England, the northern states west to about Minnesota, and the bordering Canadian provinces west to about the same longitude. At the same time, we think of the dugout canoe as dominating the Pacific northwest, the south Atlantic states, and the Mississippi River valley...and never the twain shall meet. It wasn't really quite that neat. In the Northeast, for example, Maine represents the southernmost range in which the white birch grows to sufficient size to produce canoe skins. Nice sheets of canoe bark were a valuable trade item, exported by Indians from Maine and Quebec to nearby states, and so some bark canoe building did occur somewhat south of Maine. But dugouts were much more widely used than bark canoes throughout most of New England, including southwestern Maine. Let's start in prehistory. Although the date for the invention of the birchbark canoe is in dispute (some say it might have been just prior to European contact; others place it some 500 or 600 years earlier), it is clear that dugouts were widely used throughout coastal Maine prior to that, including areas that would later become birchbark country. As far back as the Early Archaic (10,000 to 8,000 BP), tools such as gouges and whetstones were in use -- tools that may well have been used to hollow tree trunks for canoes. By the Moorehead phase (6,000 to 4,000 BP) of the Middle Archaic, there is clearer evidence. Finds of numerous swordfish bills and quantities of cod and seal bones in archaeologically excavated coastal settlement sites are sure indicators that the people were venturing away from the shore, and since the bark canoe certainly did not exist at that time, the dugout is the only craft in which they could have done so. The earliest dugout of which I've read from the region we're discussing (New England through the U.S. midwest, and adjacent Canadian provinces) is a 2,000-year old example discovered in Lake Mary, Kenosha County, Wisconsin. In 1634, the poet William Wood, who produced the first detailed map of southern New England, described dugout building in Massachusetts, writing that they were not greater than 2' wide and about 20' long. An eastern white pine dugout discovered in Weymouth, Massachusetts in 1965 (image at top of post) measured 11' x 2 ' 11" and has been dated to about 1500 A.D. -- i.e., before European contact. Three dugouts found in 2001 near Worcester, Massachusetts, date to the mid-1600s -- a time at which contact had occurred, but may not have yet significantly influenced the Nipmucs living some 75 miles west of Plymouth. For details on this find, which is an active achaeological project, see Project Mishoon.) A pine canoe found on Lake Ossipee, New Hampshire, and owned by the Museum of New Hampshire's History, has been dated to between 1430 and 1660. Mishoon an Indian boat or Canow made of a Pine or Oake, or Chestnut-tree: I have scene a Native goe into the woods with his hatchet, carrying onely a Basket of Come with him, and stones to strike fire when he hadJeld his tree (being a chestnut) he made him a little House or shed of the bark of it, he puts fire andfollowes the burning of it with fire, in the midst of many places. his come he boyles and hath the Brooke by him, and sometimes Angles for a little fish; but so tree continues burning and hewing untill he bath within ten or twelve dayes (lying there at his worke alone) finished and (getting hands) ranched his Boater with which afterward tree ventures out toflsh in the Ocean.... Some of lthe canoesl will not well carry above three or foure: but some of them twenty, thirty, forty men.... Their owne reason hath taught them, to pull of a Coat or two and set it up on a small pole, with which they will saile before a wind ten, or twenty mile.... It is wonderfull to see how they will Denture in those Canoes, and how (being oft overset as I have my selfe been with them) they will swim a mile, yea two or more safe to Land I having been necessitated to passe waters diverse times with them, it hath pleased God to make them many times the instruments of my preservation. and when sometimes In great danger I have questioned safety, they have said to me: Feare not, if we be overset I will carry you safe to Land.... (this quote taken in full from Rhode Island Sea Grant, here). Woodruff goes on to argue that the dugouts used in Michigan were not as cumbersome as is often supposed -- he cites evidence that they were at least sometimes portaged. 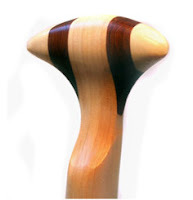 (Tuliptree is a particularly lightweight wood, and dugouts can be hewn to sufficient thinness so that they aren't outside the range of what even today's canoeists might consider portagable.) And he notes the one great advantage of the dugout: its toughness. One can drag a dugout over rocks and snags that would hole a birchbark canoe. Finally, a paper by Edward S. Rogers ("The Dugout Canoe in Ontario", American Antiquity, Vol. 30, #4, April 1965) describes 18 dugouts in that province, ranging from 10' to 20'3", and built of basswood, pine, and possibly poplar. The paper found instances of both native and European construction of dugouts in Ontario. It was unable to determine unambiguously whether dugouts were used prehistorically or if they were a technological adoption by Indians in the historic period. Regardless, it appears that dugouts were not rare in Ontario even into the early 20th century. 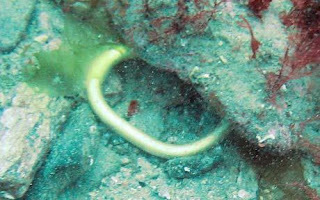 In two separate articles this week, archaeologists revealed evidence of extraordinarily old seafaring -- Bronze Age, and Stone Age. Regarding the boat itself, the article states, "experts believe it would have been up to 40ft long and up to 6ft wide, and have been constructed of planks of timber, or a wooden frame with a hide hull. It would have had a crew of around 15 and been powered by paddles." I'm not aware of evidence of true plank-built boats in Europe from the boat's estimated age of 900 BC, but the newspaper reporter may have been simplifying things. More likely, I think, would have been something similar to the Dover Bronze Age Boat, which I've written about previously. This was a transitional technology, between the dugout and the plank-built boat, in which logs where hewn into shapes that constituted longitudinal sections of a boat, then joined together with a combination of wedges and sewing with withies. Cross-Channel use of the Dover boat has been speculated, and now we see that Cross-Channel trade was in indeed process at a time not more than about 600 years after the Dover boat -- plenty of time for the elaborate trade networks to have been worked out. But that's a mere yesterday compared to exciting but indirect evidence of European seafaring some 130,000 years ago! That's not a typo, and it's more than double the age of the previously earliest evidence of seafaring anywhere: that of the original settlers of Australia some 60,000 years ago. 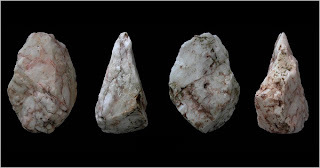 According to an article in the New York Times, archaeologists have found hundreds of stone tools on Crete that have been provisionally dated to at least 130,000 years old. Given what is known about sea levels at the time, the conclusion is that the people who first settled Crete must have done so by boat. Of course there's no direct evidence of the boats themselves, but they sure didn't swim! And what fun it is to speculate about the boats that our hominid ancestors were capable of conceiving and building with the simplest of tools. 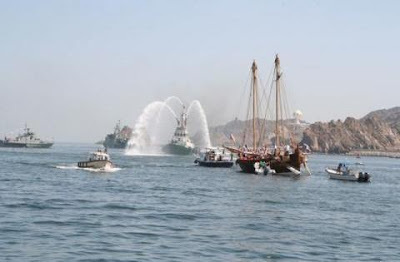 Jewel of Muscat, a replica of a 9th century sewn-plank dhow, has begun its planned 3,000-mile voyage from Oman to Singapore by way of India, Sri Lanka, and Malaysia. Jewel's website provides the details (including plenty of photos, illustrations, and videos), and one of our previous posts explains the archaeological find upon which the vessel is based: a shipwreck of what was evidently a trading voyage between the Persian Gulf and China, discovered in Indonesian waters. The image below is just one of many intriguing search results. Standing up and poling in rapids in a heavily-built dugout! Wish I could read Portuguese and learn more about this. Closer to works of art are the laminated paddles of Whiskeyjack, shown below. These are just lovely. 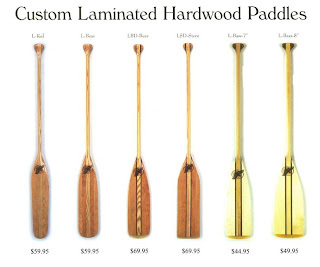 There's a video clip from a Minnesota television program featuring the builder of these paddles here. Still on the subject of paddles, here's a nice video called "Song of the Spokeshave," showing Graham Warren carving of a one-piece Algonquin-style paddle. Thanks to Kathryn Klos at the Wooden Canoe Heritage Association for calling out this one. Finally, a couple of events:. Every year I attend the Maine Canoe Symposium, in Bridgton, and have a great time. This year's dates are June 11-13. As a new member of the Wooden Canoe Heritage Association, I plan to attend their Annual Assembly for the first time. This year it's July 14-18 at Franklin Pierce University in Rindge, NH. The birchbark canoe was by far the most efficient way to travel through much of this region during much of the year, and Native Americans used the bark canoe to maintain extensive trade networks, both before and after European contact. Pre-contact, items and materials such as tool stone (e.g., flint, chalcedony), copper, furs, and birch bark itself, were traded between widely separated areas of New England and New York state via canoe, some of the routes connecting with overland routes extending into the American midwest and even into South Carolina. Post-contact, First People used the routes to trade furs for manufactured goods, especially firearms, fabrics, metal tools, and alcohol. During the numerous small and not-so-small wars of the colonial period (King Phillip's War, King William's War, Gov. Dummer's War, etc. ), large numbers of warriors moved quickly across hundreds of miles of otherwise difficult terrain by the same means. Above the Gravel Bar: The Native Canoe Routes of Maine , by David S. Cook, was originally published in 1985, and republished in 1997. This is a well-detailed book describing dozens of individual canoe routes, including both water and portage portions. Many of the original native place-names appear with the current names, and many anecdotes and legends accompany the various route descriptions. (The phrase "Above the Gravel Bar" is the translation of one such ancient place-name, but this brings up a gripe: I've seen at least two, maybe three totally different native names that purportedly translate as "where we speared sturgeon by torchlight." Maybe they loved caviar so much that they created two totally different languages to describe it?) Several maps are included which are helpful, but more detailed maps would make a good book better. Three or four chapters precede the route descriptions, covering subjects such as the importance of the beaver in establishing and maintaining some of the routes; descriptions of the region's geography and canoes; and some canoe tripping techniques. The trails are impressive in their scope and intricacy. In days before private property (but with due regard to tribal territorial imperatives), there was virtually no point in Maine that could not be reached to within just few miles by canoe at the right time of year, and this surely applied throughout the rest of the Maritime Peninsula. Before there were maps of the region or "modern" navigational tools (e.g., compass), the First People pieced together sometimes highly complex routes, moving both up- and downstream, carrying over usually short portages from one watershed to the next or to bypass rapids or long river twists, and communicating the directions verbally with such consistency that they became virtually highways, established routes known to many. 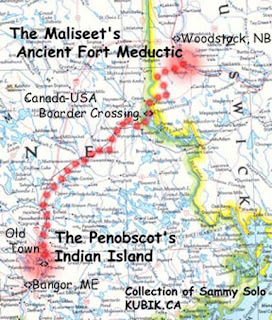 The Maliseet Trail is a website to "celebrate the Ancient Maliseet Canoe Trail; recognize the role the Trail played in both pre-contact societies and post-contact politics; and, encourage a respectful future for the Trail." The Maliseet people (also spelled Malecite) are the native people of the St. John River valley in western New Brunswick, southern Quebec, and northern and eastern Maine. As shown below, the trail itself runs from near Woodstock, NB, to Indian Island, near Old Town, in Maine. -- a distance of some 200 km. of paddling plus 15 km of portaging. The Maliseet Trail (the website) includes old maps and trail descriptions, reports of recent trips along sections of the trail, and a link to much interesting material about Edwin Tappan Adney, author of Bark Canoes and Skin Boats of North America . ...an aboriginal group of First Nations who live in the northern boreal and Arctic regions of Canada....Dene are spread through a wide region. They live in the Mackenzie Valley (south of the Inuvialuit), and can be found west of Nunavut. Their homeland reaches to western Yukon, and the northern part of British Columbia, Alberta, Saskatchewan, Manitoba, Alaska and the southwestern United States. Dene were the first people to settle in what is now the Northwest Territories. Two large logs were lashed together at one end, but held apart at the other end by a cross-log placed about midway. A platform for freight and passengers was built over the enclosed triangle, and a layer of earth permitting cooking while under way. The open space between the legs of the A furnished a safe harbor for the canoes of the traveling party, protecting them from damage by ice or debris. The image above, from Durham, unfortunately doesn't do a great job of showing this. 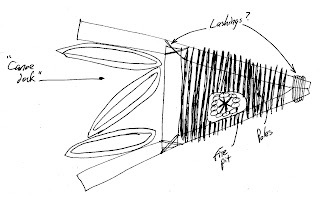 The sketch below is my own -- less accomplished, to be sure, but showing the key features. I assumed that the earthen cooking layer would have been restricted to a small area, since covering the entire decked area would have added a great deal of weight, required much work, and provided little benefit. Holy smokes, my Own Dear One found out about a canoe museum before me! The Wisconsin Canoe Heritage Museum , or WCHM, in Spooner, WI (NOT to be confused with the WCHA, i.e., the Wooden Canoe Heritage Association) plans to open its doors to the public for the first time May 29, 2010. Already, the workshop is in use, and several canoes are being worked on by volunteers.